Check out this super facial serums set deal! 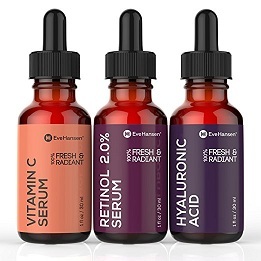 If you are looking for value for money, then this facial serums set of three serums from Eve Hansen ticks all of the boxes. 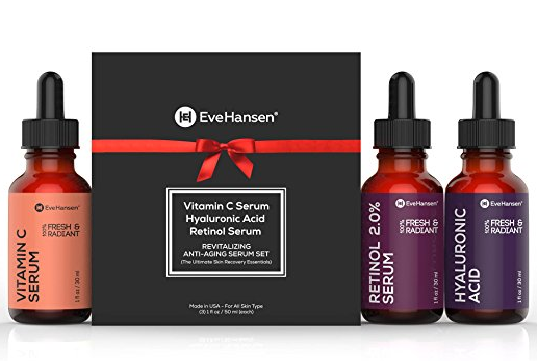 In this set, you have a hyaluronic acid serum (5%), a vitamin C serum (20%) and a retinol serum (2%) that work together to super hydrate your skin and reduce wrinkles, fine lines, dark circles, dryness, sun damage, discoloration, and hyper-pigmentation. Reverse the signs of aging fast. 72% organic and 100% vegan ingredients. No parabens, alcohol or fragrances. Each of the serums comes in a 1oz (30 ml) dropper bottle and are 72% organic and 100% vegan. Let’s take a look at each of the three serums in this facial serums set individually. Hyaluronic acid is a super hydrator that penetrates your skin, delivering a pulse of hydration right where it is needed. 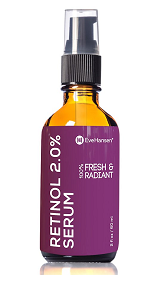 If your skin is tending to be dry, then a hyaluronic acid serum is perfect for your skin. Hyaluronic acid is also essential for the production of collagen, which is why as we become older, the natural loss of hyaluronic acid in our bodies causes our skin not only to be dry, but to loose its youthful elastic and supple qualities. When you use a hyaluronic acid serum however, your skin looks and feel so much softer, suppler and plumped. The hyaluronic acid serum in this facial serums set contains 5% hyaluronic acid, as well as aloe vera, witch hazel, MSM, green tea, vitamins C and E, and jojoba oil. Aloe vera: Well known for its healing properties, aloe vera is chocked full of antioxidants that help to reduce pigmentation problems and sun damage to your skin, caused by too much exposure to UV light. Witch hazel: A natural astringent, witch hazel is an old remedy for removing excess oil from your skin, healing blemishes and mild acne and reducing puffy eyes. MSM: Chocked full of sulfur, MSM is ideal for increasing the amount of collagen in your skin, for brightening your skin and for healing mild acne and blemishes. It also helps other nourishing ingredients penetrate your skin, so it is a fabulous ingredient. Green tea: One of the super antioxidants, green tea is awesome for fighting free radical damage caused by UV light and environmental stressors, as well as reducing sun spots and age spots and pumping up your collagen. 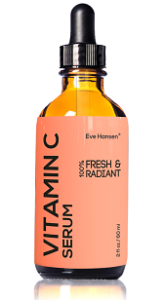 Vitamins C and E: Another two ingredients that are powerful antioxidants, vitamins C and E help to reduce hyper-pigmentation problems, reverse damage caused by free radicals and increase cellular regeneration. Jojoba oil: With antibacterial and anti-inflammatory properties, as well as mimicking the sebum in your skin, jojoba oil can easily penetrate your skin, locking in moisture and carrying important nutrients into your cells. Vitamin C is a powerful antioxidant and fights the free radical damage caused to your skin by the sun and UV light, as well as helping to reduce hyper-pigmentation problems and smoothing out your skin tone. It also helps to stimulate the production of collagen in your skin, improving the texture and feel of your skin, as well as giving your skin a brighter and fresher appearance. 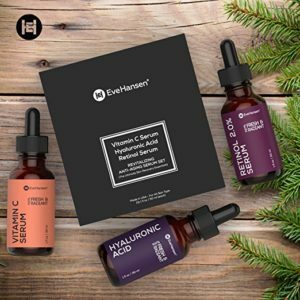 This vitamin C serum in the Eve Hansen facial serums set contains 20% vitamin C, as well as ferulic acid, vitamin E, witch hazel, MSM and hyaluronic acid. Ferulic acid: A powerful antioxidant, ferulic acid fights free radical damage that can prematurely age your skin. Free radicals destroy collagen and elastin in your skin, making you look older than your years, so ferulic acid helps your skin to keep looking younger and feeling softer and more supple. It also helps to reduce pigmentation problems and is said to be more powerful than vitamin C or vitamin E, as well as augmenting the effects of other antioxidants. Vitamin E: Another strong antioxidant and a nutrient as well, vitamin E has long been used to add extra moisture to dry skin and to reverse damage caused by free radicals and too much UV light. If you suffer from sun spots or age spots, vitamin E is a great ingredient to have in your skincare. Witch hazel: An astringent with anti-inflammatory properties, witch hazel helps to reduce puffy eyes, minimize oily skin and heal acne. MSM: Another fabulous ingredient for healing acne and blemishes, MSM helps to brighten your skin and stimulate the production of collagen. Hyaluronic acid: Known as a super hydrator, hyaluronic acid maximizes the delivery of hydration to your skin and stimulates the production of collagen. Retinol is a pure form of vitamin A that is normally found in your skin and is a powerful anti-aging ingredient. The problem is that the amount of vitamin A in your skin reduces over time, causing dry wrinkly skin with an uneven skin tone. Retinol helps to stop all of this in its tracks by boosting the production of collagen, stimulating cellular turnover and unblocking your pores. Your skin is left much smoother, suppler and cleaner than ever before! The retinol serum in this facial serums set contains 2% retinol, as well as green tea, aloe vera, witch hazel, vitamin E and jojoba oil. Green tea: A powerful antioxidant, green tea helps to reduce pigmentation problems, fade sun spots and age spots and plump up your skin. Aloe vera: Known for its healing and anti-inflammatory properties, this wonderful antioxidant helps to reverse damage caused by UV light and too much exposure to the sun, as well as smoothing out your skin tone. Witch hazel: An old remedy for keeping your skin clean and reducing mild acne, the stringent properties of witch hazel also reduces puffiness around your eyes and the amount of oil in your skin. Vitamin E: Another strong antioxidant, vitamin E helps to fight free radical damage, reduce pigmentation problems and stimulate the production of collagen in your skin. Jojoba oil: This ingredient helps to lock moisture into your skin and facilitates the penetration of other nutrients. What do customer say about this Facial Serums Set? Online customer reviews of this facial serums set are very positive with more than 90% giving it a 4 or 5 star rating. Customers love that these serums actually work as promised and that their skin looks more hydrated, brighter and healthier. This is such a super deal and is much cheaper than buying all three serums separately! About a month ago I started using the vitamin c and hydraulic acid (and the retinol serum). It takes longer for my morning and night routine but I think its worth it. I love it. Youthful skin, just like it says! Would buy it again. I’ve had the serums for two weeks so far and see skin texture and complexion results. This stuff is awesome! Great price, great size bottles, and the actual product has my face looking amazing after just a week! I am delighted with this set, will keep using it and will purchase more Eve Hansen products in the future. Use them everyday and believe I’m seeing some results in 2 weeks. With this lovely facial serums set, you have three of the best serums for reversing the signs of premature aging and giving your skin a wonderful healthy, fresh and clean glow. The hyaluronic acid adds a super pulse of hydration to your skin, the vitamin C serum brightens your skin and reduces pigmentation problems and the retinol serum boosts the production of collagen in your skin. All three of these serums have fabulous ingredients that work with one another to give you visible results in just a few weeks. Customers love this facial serums set and it is such a great deal! Currently selling for less than $25 for all three serums, this price can’t last long! Read more of my Featured Skincare Articles here.